Tateyama area is located eastern Toyama Prefecture. It is famous for a beautiful mountains. 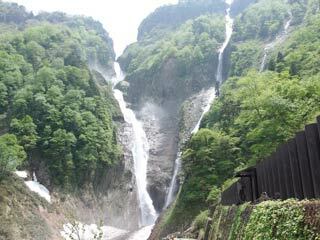 There are many beautiful waterfalls, including Syomyo Falls, the highest waterfalls in Japan. This area is also famous for heavy snow in winter. In winter, Tateyama-Kurobe alpine route has the huge snow wall which layered over 20m tall. You can enjoy the giant snow valley right next to you at thsi route. There are many Onsen, sky resorts, as well. Of course, in summer Tateyama offers great hiking and climbing. Use Tokai-Hokuriku Express Way to Hokuriku Express Way to north. Exit at Tateyama. 6 to Tateyama. Use Hokuriku Shinkansen to Toyama Station. Change to Toyamachitetsu Tateyama Line Tateyama Station.